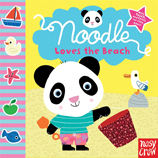 Noodle loves to dig and splash and have fun on the beach. With a scratchy sand castle and flappy sail, this is perfect for car trips and vacation. With touch and feels for little paws! Marion Billet has illustrated more than eighty children’s books, which have been published in eleven countries. Her work has also appeared in magazines and on stationery, toys, children’s furniture, and clothes. She lives in Paris.